I believe that everyone wants to be free to make their own decisions. And thus the same goes for Novi, our baby. For him to make his own decisions we don’t have to wait until whenever. In fact, from birth on he’s been the king in the house: we just obey to his needs and give him love and care. And now whilst he is growing we like to continue on this path to listen to his needs carefully and not to enforce things upon him. Which means we have him sit and enjoy his food the way he likes it. In addition to breast-milk, we now give him pieces of tomato, cucumber, courgette, apple, banana as well as rice-crackers. And he can eat whatever he wants. 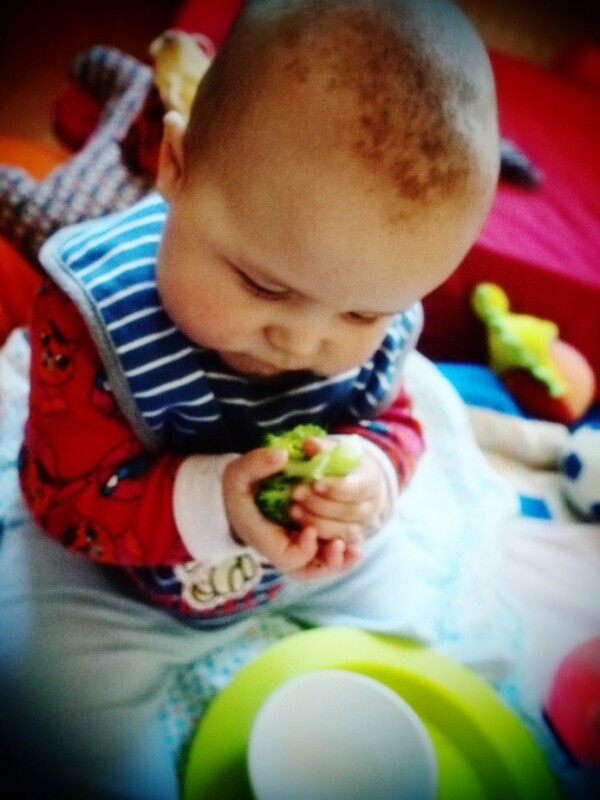 We love this method, that goes by the name of Baby Led Weaning. Not just for the freedom it gives (and the Money we save, see the article in Dutch Geen geld en zwanger). But we also love this way of letting him eat because we really get to enjoy him eating. We don’t spoon-feed him and we don’t force him to eat anything, and in return we get a happy and self-learning baby who simply *loves* to eat.